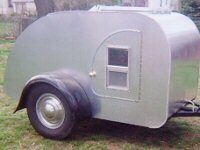 Teardrops n Tiny Travel Trailers • View topic - CA Central Coast...anyone around here?? CA Central Coast...anyone around here?? We've just moved to the California Central Coast. Nipomo, specifically. I was wondering if there are other Forum members in the area who might like to get together for an impromptu gathering someday. Re: CA Central Coast...anyone around here?? Mike, I'm in the central Sierra Foothills, about 5 hrs from you. I fear the day that technology will surpass our human interaction, the world will have a generation of idiot's. Mike, Welcome to the beautiful CA Central Coast! I'm about a half hour away in SLO slowly building one. Several friends in Los Osos have teardrops. A man in Morro Bay I met recently plans to built one. There are several others around the area who have teardrops that don't participate in TNTTT. Friends and I have done three SLO Gatherings. We'll revive them in the future...possibly next year at Morro Bay State Park. Several of us may organize a Tearjerkers gathering this November along the Gaviota coast of Santa Barbara County, CA. We're in the beginning stage with the idea of doing a gathering there. We will scout the state parks/beaches like Refugio State Beach and El Capitan State Beach to see how suitable they are. Beautiful Jalama Beach south of Lompoc, CA might be another possibility. 8/15/2014 edit: Refugio SB is now too booked up in November to be able to do a gathering there. Campsite there are $45, or more, per night. Too pricy for me. Last edited by Esteban on Fri Aug 15, 2014 11:57 am, edited 1 time in total. Hi all, I am located in South San Jose and very close to Dan. I would like to be included in any gathering we may be able to arrange. I like that SLO area and may be up for a road trip. I have attanded all of Steve's gatherings in the past. I have belonged to this forum from the beginning. I am between teardrops The old one I can still sleep in but it was in an accident coming home from 2014 IRG. I am building a new one with a galley and trolley top. Build slowed down do to sewer. I saw you in forum early on but did not get to say hello. Have contact with sever others who own TD's in area that like to camp out too. You might join http://www.tearjerkers.net/ I belong to the one out of the bay area. No chapter here yet. offering many gatherings north and south. I mostly go to northern CA. gatherings. Hi Ron. How are you doing my friend? I can lend you a hand again with your teardrop if you want. I recently returned from IRG 2016 way up on the Northern California coast near Eureka. Slept in a "soft sided teardrop" just to be there. I really don't like sleeping on the ground in a tent. Those days were supposed to all be in my past. After one uncomfortable sleepless night I drove in to Eureka to buy a sleeping cot to make tent camping less intolerable. On the upside my motivation to get on with the construction of my teardrop considerably increased. I was holding off a little to go to IRG to see if that changed my plans much. Learned a few things that I'll incorporate. So my plan changed just a little bit.There's a local Makerspace workshop I can join to provide some of the tools and work space I need to build my teardrop. The 2017 Shasta Gathering is now on my bucket list. As Ron said friends and I put on three SLO Gatherings. At IRG 2016 I chatted with Wes from SoCal who came to the first SLO Gathering. That was fun. Once I have a campable teardrop I really want to do more gatherings and explorations. Will want and need help from friends and fellow teardroppers to do them. I've talked on the phone with Vedette/Brian from B.C. Canada and Todd from Tearjerkers about creating another California Tearjerkers chapter and the possibly of co-directing it. That may (or may not) come about the future. I had the pleasure to again meet Lydia and see her Lady Bug trailer (we first met in Mendocino and at IRG 2008) at IRG 2016. She's the director of the Jefferson State Tearjerkers Chapter. Lydia very successfully organized the recent Shasta Gathering after the Dam Gathering came to an end. There seems to be many more teardrop owners on the California Central Coast than most of us are aware of. Small world. At IRG 2016 Stacy T. and Fred told me a woman from SLO was camping there in her teardrop. She apparently left the Pamplin Grove Campground before we had a chance to meet. Maybe we need to have some kind of social get together to meet one another and to begin planning some future events? Possibly something like a SLO Teardroppers potluck at Montana de Oro State Park? If there's enough interest I'll set a date for it. Local people could come for the day and/or people from greater distances could come to camp overnight there. We had the 1st SLO Teardrop Gathering there (thanks Gage for the photos) that attracted people from near and far (Idaho) who completely filled the campground with teardrop trailers in Sept. 2007. It could become the SLO Gathering 3.5! Last edited by Esteban on Sun Jun 12, 2016 7:15 pm, edited 2 times in total. Being the most south and west TD, anywhere is ok with us since we have to drive anyway. We are relocating to the Bishop area next year, there doesn't seem to be a lot of activity on the eastern Sierras either. BUT is has tons of camping areas. Bill n Robi wrote: Being the most south and west TD, anywhere is ok with us since we have to drive anyway. We are relocating to the Bishop area next year, there doesn't seem to be a lot of activity on the eastern Sierras either. BUT is has tons of camping areas. you are right I camped there several years back with my cousin. camped to the right in the line of trees. The only problem with had was Bear boxes are dark Red. and most of our food was shot. Next time we will bring a white sheet to cover it with. But is a lovely place. We also camp in Tehachapi at the rv place by the glider plane field. There are several places there too. If we became a Tearjerker Chapter a thought I had too. how far north and how far south. Can we over lap? I would guess we would to the Navada line. Thanks for the tip Doug. Jane has been putting those reflective windshield covers on the bear boxes for years. They help keep our ice longer too. We always freeze 1/2 gallon bottles of water at home and put them on the bottom of the ice chests then use the water when they thaw. We'll give this wet blanket idea a try.